Uganda's highest mountain, Mount Stanley, is shared with the Democratic Republic of the Congo. 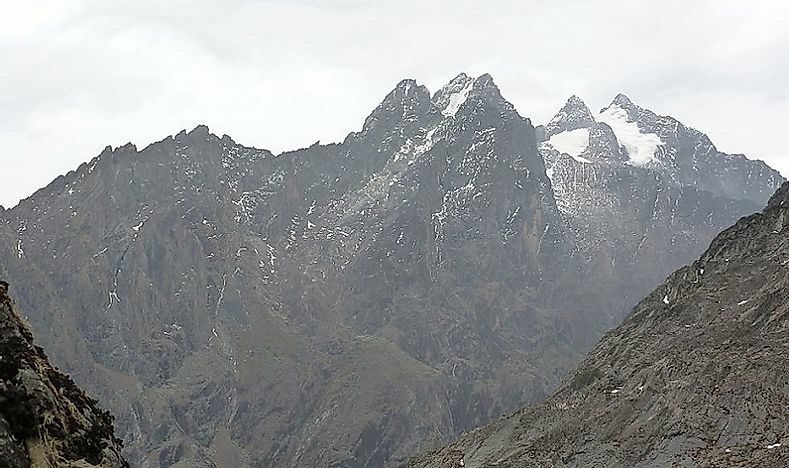 The major peaks of Mount Stanley. Uganda is an East African country that covers an area of 241,000 square kilometers. The land-locked country is endowed with a wealth of natural features. Its landscape is scattered with snow-capped mountains, beautiful lakes, and dense forests. The tallest mountain in Uganda is Mount Stanley. Other notable mountains include Speke, Kiyanja, Gessi, and Luigi di Savoia. Stanley, Uganda’s tallest mountain, stands at an elevation of 16,762 feet (5,109 meters) above sea level. It is Africa’s third tallest mountain, coming behind Mt. Kilimanjaro and Mt. Kenya. The mountain is found within the Ruwenzori mountain ranges in southwestern Uganda. It got its name from the explorer Sir Henry Morton Stanley. The mountain’s top is covered in snow, and the climate in the area is an alpine climate. Mount Stanley experiences heavy rainfall for most of the year, especially on the Eastern side. The Mountain has diverse vegetation that varies depending on the altitude. Dense mountain forests are found within 1,800 to 2,400 meters above sea level. As you go up, the bamboo zone emerges at between 2,400 and 3,000 meters in altitude. High up, heather plants, lichens, flowering shrubs and giant lobelias grow at altitudes of between 3,000 and 3,800 meters. At the Alpine top, giant rosette plants and lichens can be found. Rare and endangered animals such as the moon-striped mouse, horseshoe bat, otter shrew, and the Ruwenzori turaco inhabit the slopes of Mt. Stanley. The mountain is within a protected area of the Ruwenzori National Park, a world heritage site. Mount Speke is the second highest mountain in Uganda at the height of 16,043 feet (4,890 meters). It is found within the Ruwenzori mountain range. Mount Speke, Mt. Stanley and Mt. Baker form a triangle that encloses the upper Bujuku valley. The mountain experiences heavy rainfall for the most of the year, and as a result, many rivers and streams run across the area. Thick vegetation covers the slopes of the mountain. Additionally, a variety of animals such as leopards, antelopes, elephants and chimpanzees inhabit the mountain. Mount Speke is a sacred mountain for some local communities who believe that God resides at the top of the mountain. Mount Kiyanja, also referred to us Mount Baker, is Uganda’s third highest mountain at the height of 15,892 feet (4,844 meters). It is part of the Ruwenzori mountain ranges. It lies in an area referred to as ‘The Mountains of the Moon.' The mountain took its name from that of a 19th Century British explorer, Samuel Baker. Mount Kiyanja has snow cover, lush forests and deep valleys that provide scenic views to visitors. Local people guide climbers up the mountain. Mount Gessi stands at the height of 15,469 feet (4,715 meters). It is Uganda’s fourth highest mountain. Mount Gessi is found along the Uganda-Democratic Republic of the Congo border, and to the north of the triangle formed by Mt. Stanley, Mt. Speke, and Mt. Baker. The mountain has twin peaks named Lolanda and Bottego. Shanties are scattered on the slopes of the mountain where local communities live. The mountain has a rocky landscape and good trails for climbing. The mountain is home to unique creatures such as blue monkeys, colobus monkeys, and bushbucks. Grasslands and shrublands are common at the bottom of the mountain. The mountain is within a protected area and hence, the vegetation and animals within the park are protected. Uganda has an abundance of mountains. Some of the mountains rise as high as 4,500 meters above sea level. The mountains provide a habitat for numerous plants and animals. Besides, they add beauty to Uganda’s landscape. In an attempt to conserve the natural wealth found in the mountains, Uganda Wildlife Authority protects the mountain areas in conjunction with local communities.